﻿Hello, welcome to another edition of the Railwaymedia Blog, up to number 31 now. I've only been out and about with my camera twice since I published Edition Number 30, Friday to Cardiff and yesterday a quick nip over to Blackpool. The links will take you to all the pictures, but if you want a quick résumé of exactly where I ended up and why, then please read on! With yesterday, Sunday, being a lovely sunny day in the North West, I decided to have a trip over to Blackpool. On mild autumnal evenings it is always a pleasure to spend some time on the quiet end of Blackpool's Promenade north of the Metropole Hotel up towards Bispham and Cleveleys. 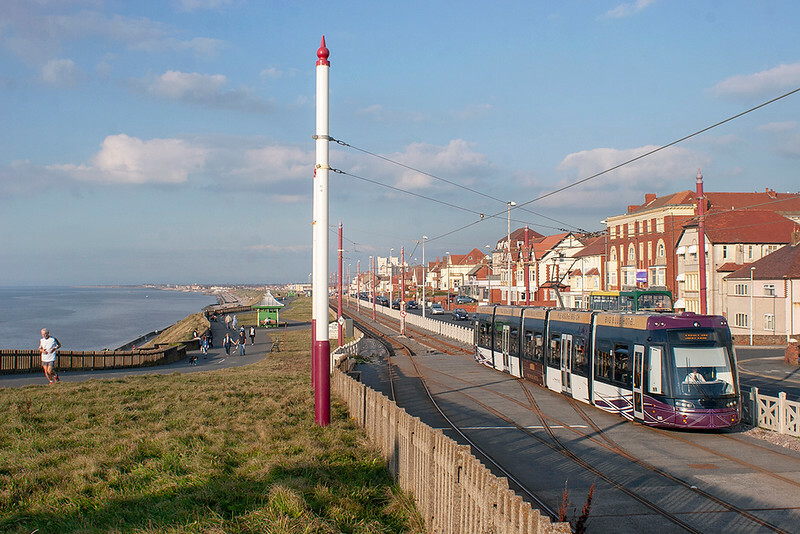 It is just under a year since the end of the traditional operation of the Blackpool Tramway, 6th November 2011 being the day it closed for the final refurbishment to allow the new low-floor service. 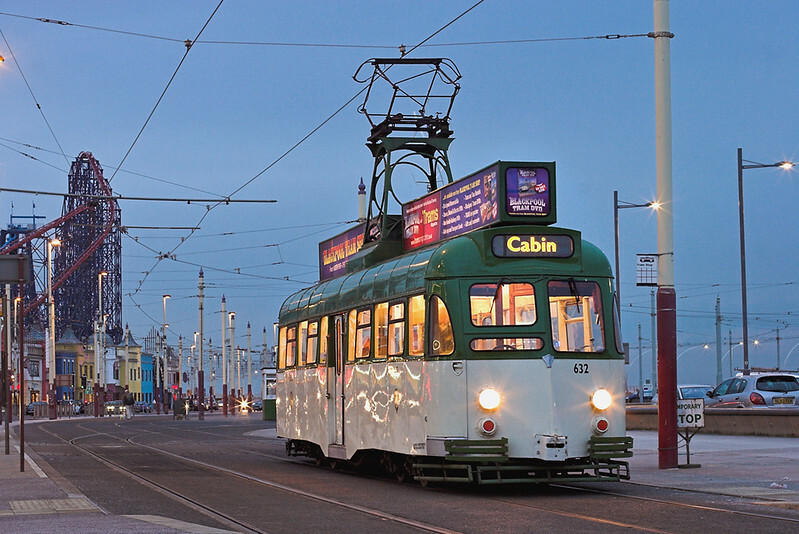 Now of course there is an excellent 10-15 minute frequency operated by the new Flexitiy Trams, also at weekends a half-hourly 'Heritage' tour service. I had hoped to get a few shots of these but hadn't realised that during the Illuminations the old trams only come out to play at night! So in the end yesterday I just had a walk along the front with my two daughters, got a few pictures, and then spent about an hour, and a few quid, having to play on the 2p machine in Bispham Amusements. The tramway is not nearly as interesting though as it was 12 months ago. Having got a picture of Flexity number 016 yesterday, I have finally shots of all the new vehicles so, unfortunately, there is little point me returning unless they start applying overall advertising to the vehicles. A day out somewhere had been planned for the day, though I left it until the night before to decide where. 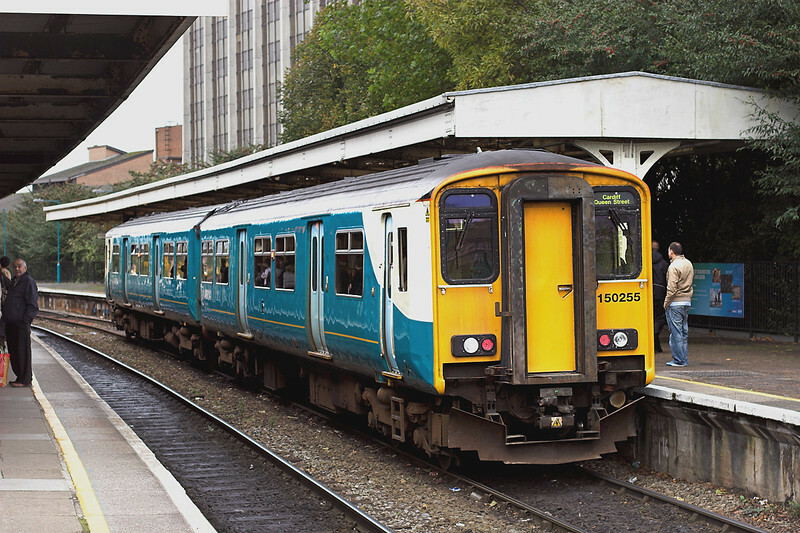 I recieved an email containing a picture of Arriva Train Wales' class 121 on the Cardiff Bay shuttle Thursday morning. This 50 year old unit has been out of service for some time requiring new wheels, so its return to operation swung it for me to visit Cardiff; I hadn't seen that particular class 121 and also I've never travelled over the short Cardiff Bay Branch. I still haven't travelled it either as enroute to Barry for breakfast in Wetherspoons, I saw the 121 was parked on Canton depot. 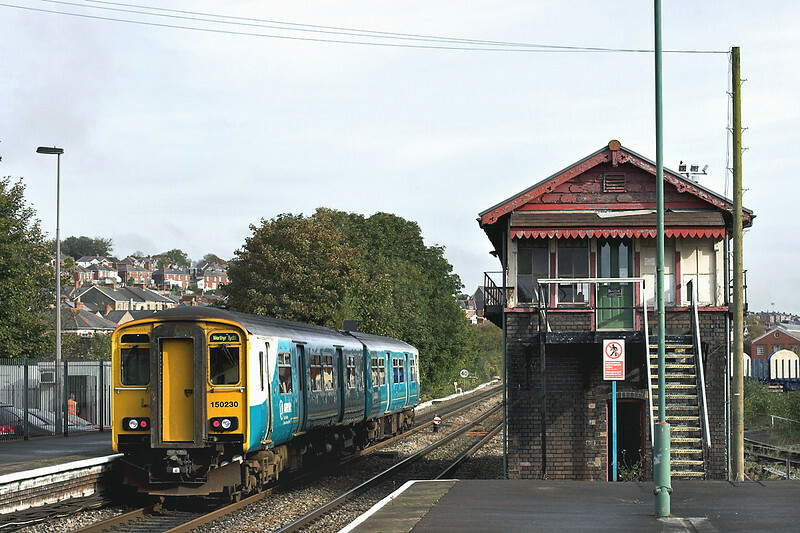 Barry signalbox, pictured above, will be surviving for around another 2 years as resignalling is under way on the Vale of Glamorgan line from here to Bridgend. This line was reinstated for passenger use 7 years ago and after a swift breakfast I caught the next train over this section; another new line for me. I rather wish I had jumped off at Rhoose for an hour as it was sunny and there appeared to be an empty coal train waiting to leave Aberthaw Power Station as I passed. 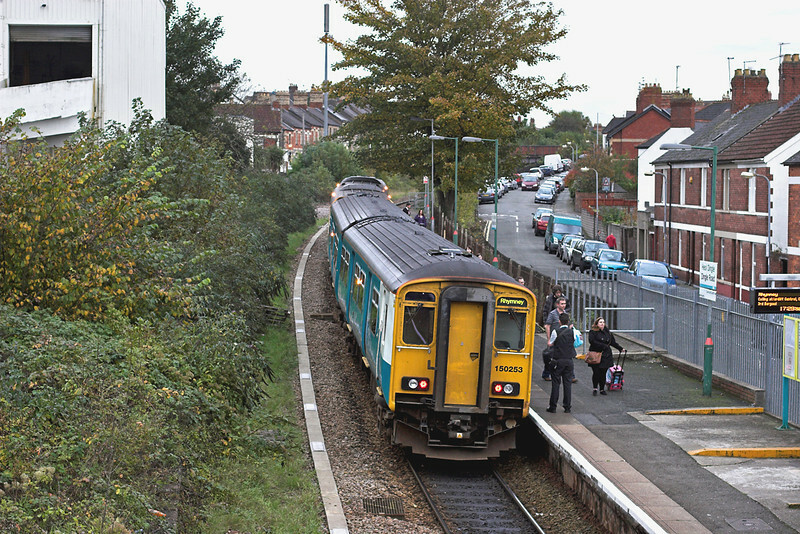 Returning to Cardiff Central, the first train that came into platform 6, the Valley Line platform, was bound for Rhymney. 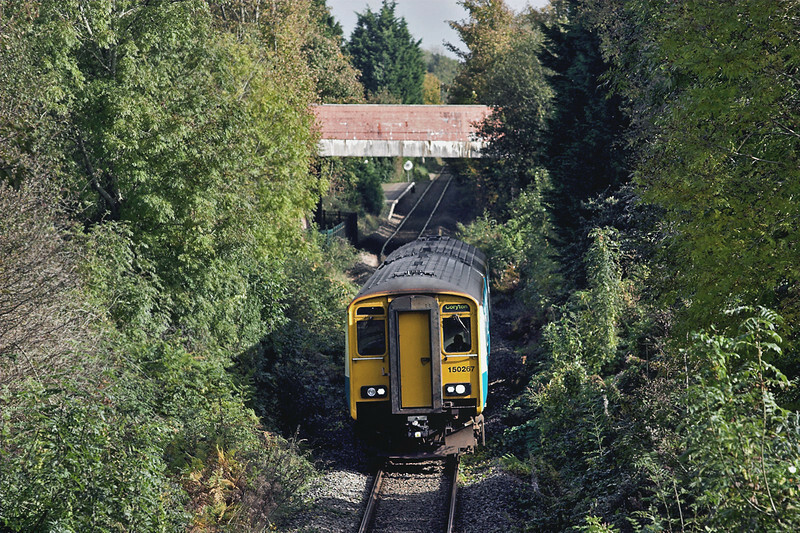 Being a line I've done many times when there used to be regular class 37 hauled services on Saturdays, I went one stop to Queen Street and then boarded the following Coryton train, that being one of the many branches to the north of Cardiff that I haven't previously visited. The line is under 3 miles long and in that distance manages to cram in 6 stations. Is this a record on Network Rail? The view above is taken from just before Coryton station and shows behind one of the three stations in the country to be called Whitchurch. I'd walked to this bridge after alighting the previous train at Rhiwina, the stop beyond, which would also be visible if it wasn't for the A470 road bridge. Currently trains from Coryton extend beyond Cardiff via the 'City Line' to terminate at Radyr. Radyr is only just over a mile away as the crow flies on the other side of the River Taff from Coryton, so it would probably be quicker to walk than catching the train taking 42 minutes! I alighted on the return at Birchgrove which seemed to be the nearest station to the Heath branch of Wetherspoons. It was, but a longer walk than between about 4 Coryton Line stations would be. It appears I was lucky not to be run over as there was a bloke driving round Cardiff at that time in a white van knocking down pedestrians. I didn't hear anything about this until I got home, despite spending the next 2 hours having a few pints in several of the central Cardiff Wetherspoons. With the Cardiff Bay shuttle (above) being rather over-provided for with a class 150, and time pressing, I forwent the trip there in order to do another branch I needed, Penarth. The Wetherspoons where I planned to have tea is about half way between Penarth and the previous stop Dingle Road. Like on the Coryton Line these two stations are very close together, and indeed the branch is only a mile in length, though with a 15 minute frequency trains don't spend long at the terminus. 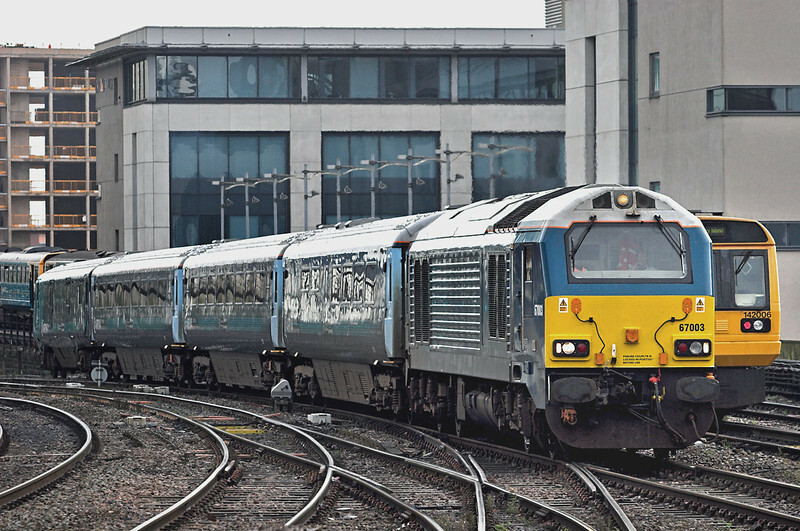 The last time I had gone down to South Wales, a trip to Newport mentioned in Blog Number 19, I had caught the 'WAG Express' down from Crewe and photographed it on the return working, the 1615 Cardiff to Holyhead. Since September however the workings of it have been altered. The morning journey, inconveniently for me at least, goes via Wrexham instead of Crewe. The afternoon service also goes that route but has been retimed to depart Cardiff much later at 1821. Being later this is also no good for me to photograph the train, it being of course dark at this time of the year, but also because the Manchester train half an hour later is the last I can realistically catch home. Still, instead I was able to ride it back to Chester, though being a Friday it was very busy. The previous formation of a Mk3 First Class (with Buffet), two Open Standards and a half Standard with Brake Van, has now changed to the same First Class coach but with two Mk3 Standards and a DVT. This has in effect reduced capacity for normal passengers to about that of a class 158. I did though get a shot of it arriving Cardiff in the morning. It's interesting that where Chiltern are saying using locos is now more cost effective for them than units for operating trains with 7 or more coaches, Arriva Trains Wales have actually reduced the capacity and, if it wasn't for the First Class restaurant service provided basically for the Members of Parliament that use it, a two or three car class 175 would be more than enough and more practical. It isn't often you will hear me arguing against the use of locos and coaches, but for me the economics just doesn't add up for this train. So, after that contentious point, I shall bring this edition of the blog to a close. There are still quite a few branches (lines and Wetherspoons) in the Valleys that I haven't yet been to. Off the top of my head they are Maesteg, Treherbet, Merthyr and Ebbw Vale (also of course Cardiff Bay), so a return visit may well be made soon, though a few of the pubs appear to be off the railway network. As always I shall leave you with this weeks stupid sign. Regular readers will know through work I spend quite a bit of time at Crewe, though normally at night. Being there during daylight yesterday for a change I noticed this newly erected sign at the entrance to the former Diesel Depot. 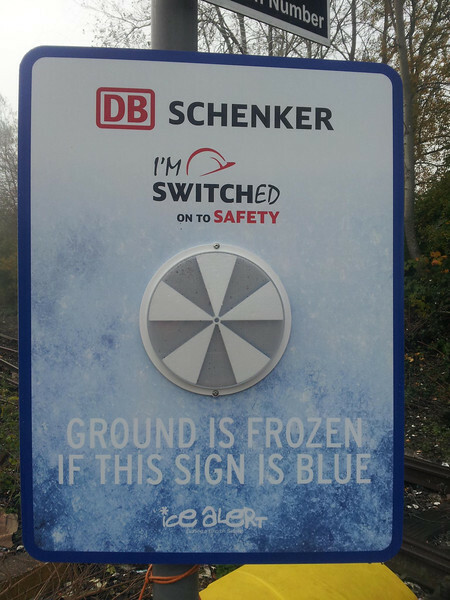 I've long held the belief that Crewe exists in some sort of Arctic micro-climate (certainly feels that way sometimes), but is the proof that it is actually built on Tundra. Thanks for reading!